Starting today, Nintendo 3DS owners across the United States and Canada can download a free application that allows Netflix members to watch TV episodes and movies streaming from Netflix with an Internet connection. The 3DS will also also soon have access to "an additional library of select movies" that can be viewed in 3D, Nintendo says. "The new Netflix application looks great, plays great and is a fantastic consumer experience," said Nintendo of America President Reggie Fils-Aime. "It gives Nintendo 3DS owners access to an amazing wealth of movies and TV shows, which they can watch conveniently from thousands of free Wi-Fi access points across the country. Nintendo 3DS truly offers something for everyone." The new Netflix application, available for free on Nintendo's eShop, displays movies and TV episodes in 2D on the system's upper screen. "Users will soon have access to an additional library of select movies that can be viewed in 3D without the need for special glasses," according to the press release. Use of the Netflix application on Nintendo 3DS requires a broadband Internet connection and a Netflix streaming membership starting at $7.99 a month. 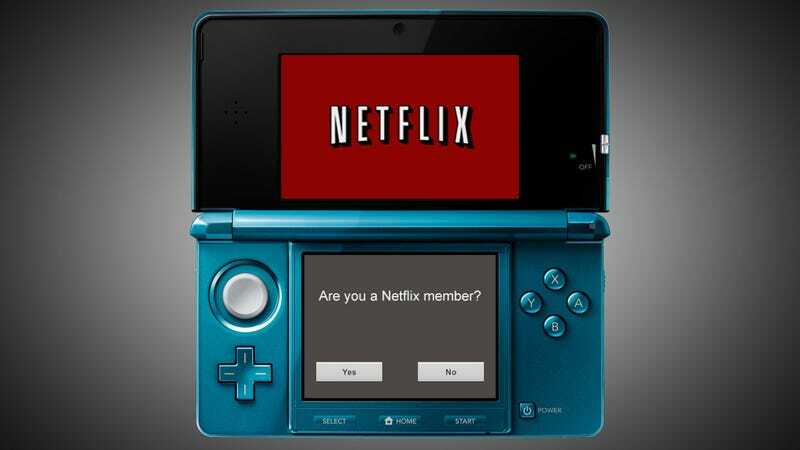 The Nintendo 3DS system's parental control settings can be used to manage access to the Netflix application. Parental control settings already associated with a Netflix account will be applied to the streaming content viewable on the Nintendo 3DS system.